Approximately 7%–10% of patients with ESKD worldwide undergo peritoneal dialysis (PD) as kidney replacement therapy. The continuous nature of this dialytic modality and the absence of acute shifts in pressure and volume parameters is an important differentiation between PD and in-center hemodialysis. However, the burden of hypertension and prognostic association of BP with mortality follow comparable patterns in both modalities. Although management of hypertension uses similar therapeutic principles, long-term preservation of residual diuresis and longevity of peritoneal membrane function require particular attention in the prescription of the appropriate dialysis regimen among those on PD. Dietary sodium restriction, appropriate use of icodextrin, and limited exposure of peritoneal membrane to bioincompatible solutions, as well as adaptation of the PD regimen to the peritoneal transport characteristics, are first-line therapeutic strategies to achieve adequate volume control with a potential long-term benefit on technique survival. 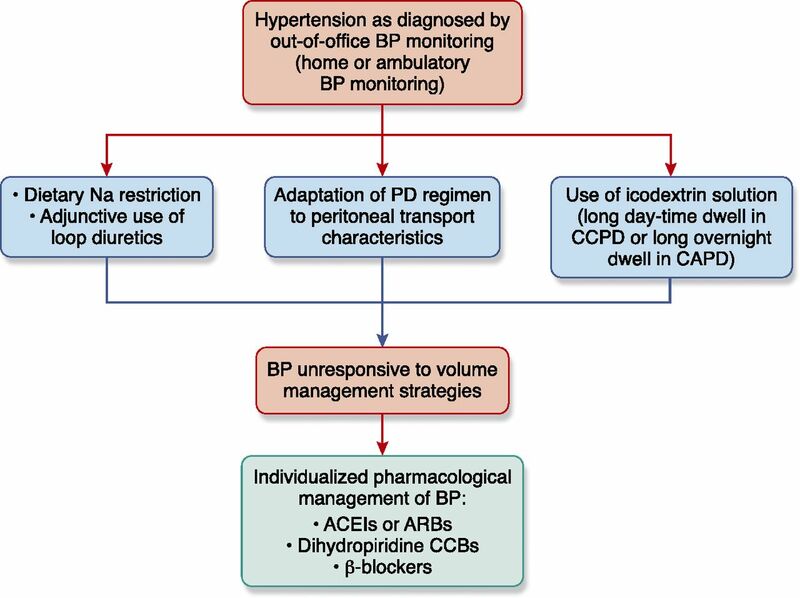 Antihypertensive drug therapy is a second-line therapeutic approach, used when BP remains unresponsive to the above volume management strategies. In this article, we review the available evidence on epidemiology, diagnosis, and treatment of hypertension among patients on PD and discuss similarities and differences between PD and in-center hemodialysis. We conclude with a call for randomized trials aiming to elucidate several areas of uncertainty in management of hypertension in the PD population. The continuous nature of kidney replacement therapy is considered as major advantage of peritoneal dialysis (PD) over hemodialysis (HD) (1). Nonetheless, epidemiology of hypertension appears to be similar in both modalities because elevated or uncontrolled BP is highly prevalent among patients on PD and is associated with mortality (2–4). Although hypertension in PD is managed using similar therapeutic strategies with those applied in HD (2), there are also some differences that require attention. For example, volume management in PD should take into consideration the value of preservation of residual kidney function and longevity of peritoneal membrane function (5). In this article, we provide an overview of epidemiology, diagnosis, and management of hypertension in PD. We discuss similarities and differences between PD and in-center HD and provide directions for future research in these important areas. Earlier studies suggested that hypertension might be more adequately controlled in PD than in HD. The 1995 Peritoneal Dialysis Core Indicators Study reported that among 1202 patients on PD, only 29% had systolic BP >150 mm Hg and 18% had diastolic BP >90 mm Hg (6). In contrast, a study enrolling 2535 patients on HD in the United States showed that hypertension affected up to 86% of study participants (7). Subsequent studies showed a high burden of hypertension in PD. The Italian Co-operative Peritoneal Dialysis Study Group reported that among 504 patients on PD, the prevalence of hypertension was 88%, using the World Health Organization/International Society of Hypertension (WHO/ISH) diagnostic criteria (8). Uncontrolled clinic BP ≥140/90 mm Hg was detected in 79% of drug-treated hypertensives. Using ambulatory BP monitoring, 77% of drug-treated hypertensives had poor BP control, indicating a high burden of hypertension (8). The natural course of hypertension was retrospectively evaluated in 207 patients on incident PD (9). Using the WHO/ISH criteria, hypertension was prevalent in 93% of participants at initiation of PD. Longitudinally, BP was improved and reached a nadir during the first 6–12 months of follow-up; thereafter, a progressive deterioration in BP control was evident. Older age, severity of preexisting hypertension, and loss of residual kidney function were determinants of deterioration in BP control (9). In a cosinor model analysis of 11,833 BP measurements obtained during 44-hour ambulatory BP monitoring in 125 patients on HD, increments in interdialytic weight gain were associated with higher linear increase and blunted circadian amplitude of BP between dialysis treatments (10). These volume-mediated alterations in the ambulatory BP rhythms may be less prominent in PD, owing to the “steady” volume state of these patients. Luik et al. (11) showed no difference in diurnal BP variation when 20 patients on continuous ambulatory peritoneal dialysis (CAPD) were compared with 20 patients on HD. Rodby et al. (12) showed that the circadian pattern of 48-hour BP was not different in a comparison of 27 patients on CAPD with 33 patients on HD. However, patients on HD had higher 48-hour BP levels and BP loads (12). By contrast, Tonbul et al. (13) showed that the average 44-hour BP levels and loads were similar between 24 patients on CAPD and 22 patients on HD. Daytime BP during the dialysis-on day was lower in patients on HD than in patients on CAPD; the reverse phenomenon occurred during the dialysis-off day (13). Larger head-to-head comparisons are warranted to elucidate similarities and differences in ambulatory BP between HD and PD. Frequent night-time and long daytime dwells may interfere with peritoneal sodium removal, suggesting a less effective BP control in automated peritoneal dialysis (APD) compared with CAPD (1). Comparative studies showed that BP levels, antihypertensive drug use, the presence of pedal edema, and extracellular body water assessed with bioelectric impendence analysis (BIA) are not different between the two modalities (14). Studies using ambulatory BP monitoring suggested that 24-hour BP loads and diurnal BP variation are comparable between APD and CAPD (15). These observations, however, are derived from small, cross-sectional studies without appropriate matching between comparison groups. Similar to the U-shaped association of peridialytic BP with mortality among patients on HD (16), cohort studies showed that clinic BP is inversely associated with mortality in patients on PD (Table 1) (4,17,18). This “reverse” epidemiology of hypertension may be explained by a number of factors that confound the association of high BP with mortality risk. In a cohort of 2770 patients on incident PD, each 10-mm Hg higher systolic BP was associated with 16% lower risk for all-cause mortality over the first year of follow-up (4). However, higher systolic BP was associated with excess risk for late mortal events, suggesting that dialysis vintage modifies the association of BP with mortality (4). The level of illness and severity of comorbidities with opposing effect on BP is another factor that affects the predictive value of hypertension. In a cohort of 77 patients on PD, when the analysis was adjusted for severity of congestive heart failure, the inverse association of lower systolic BP with excess mortality risk was mitigated (17). By contrast, the pulsatile component of BP provides a more direct mortality signal (3,19). The linear association of higher pulse pressure with mortality is possibly reflecting a state of accelerated arterial stiffening in ESKD. Lastly, the epidemiology of hypertension may vary considerably if out-of-office BP recordings are used as risk predictors. Among patients on HD, home and ambulatory BP recordings are linearly associated with excess mortality (16). Prospective studies are warranted to elucidate the prognostic significance of out-of-office BP recordings in PD. The optimal BP targets among dialysis patients remain unknown. The reverse association of clinic BP with mortality in observational studies in contrasted by meta-analyses of randomized trials showing that deliberate BP lowering with antihypertensive drugs is associated with improvement in clinical outcomes (16). The feasibility and safety of BP lowering is also supported by the BP in Dialysis trial (20), in which 126 hypertensive patients on HD were randomized to an intensive, predialysis systolic BP target of 110–140 mm Hg versus a standard target of 155–165 mm Hg. Intensive BP lowering did not aggravate the incidence of major cardiovascular adverse events, hospitalizations, or vascular access thromboses (20). Larger, phase 3 trials evaluating “hard” clinical end points are warranted to define optimal BP targets. Until such evidence become available, we encourage the wider use of out-of-office BP monitoring as an approach to optimize risk stratification, and we support the current International Society of Peritoneal Dialysis (ISPD) recommended target of <140/90 mm Hg for self-measured home BP (5). The optimal method to diagnose hypertension, detect the presence of target organ damage, and prognosticate the risk of mortality in patients on PD is an area of controversy. The availability of home BP recordings routinely taken by patients on PD offers the advantage of using a theoretically superior BP-monitoring technique in hypertension management (2). Studies comparing the diagnostic accuracy of different BP-monitoring techniques are summarized in Table 2, and suggest that routine BP recordings taken by the patients themselves at home are worse than standardized clinic BP in approximating daytime ambulatory BP and in detecting evidence of target organ damage (21–23); this discrepancy is possibly explained by the absence of standardized protocols for home BP monitoring. Similarly to nondialysis populations, ambulatory BP monitoring is the gold-standard method in management of hypertension in PD (2). Using this method, the aforementioned Italian Co-operative Peritoneal Dialysis Study uncovered a nondipping status in 53% of 504 participants (8), confirming the high prevalence of nocturnal hypertension in this population. Owing to the low availability of ambulatory BP monitoring, we recommend the use of office BP measurements as the standard of care, and encourage the wide use of validated BP monitors as an approach to optimize the diagnostic accuracy of home BP recordings (2). Additional research is warranted in this area because currently available studies are small and underpowered. The first step in management of hypertension is the adequate clinical assessment of volume status (Figure 1). The ISPD guidelines (5) mandate the recognition and control of volume overload as first-line therapy of hypertension. Volume control as first-line therapeutic approach of hypertension among patients on PD. Diagnosis and management of hypertension among patients on PD should be on the basis of out-of-office BP monitoring. Given the poor diagnostic accuracy of conventional office BP recordings and limited availability of ambulatory BP monitoring, we recommend the wide use of home BP recordings taken by the patients themselves, with validated automated BP monitors as an alternative approach to confirm diagnosis and guide the overall management of hypertension. Management of hypertension should firstly be relied on adequate control of sodium and volume excess. Lowering dietary sodium intake, appropriate use of loop diuretics in the presence of substantial residual kidney function, adaptation of dialysis regimen to peritoneal transporting status, and use of icodextrin solutions during long daytime dwell in APD or during the long overnight dwell in CAPD are first-line volume management strategies. Antihypertensive drug therapy should be initiated when hypertension remains uncontrolled despite the adequate management of volume. Choice of the appropriate antihypertensive regimen should be individualized, taking into consideration the comorbidities and overall risk profile of each patient. Although comparative efficacy and safety of different antihypertensive drug categories among patients on PD remains elusive, some clinical studies suggest that angiotensin-converting enzyme inhibitors (ACEIs)/angiotensin receptor blockers (ARBs) exert beneficial effects on a number of intermediate clinical end points, including long-term preservation of residual kidney function. CCB, calcium-channel-blockers; CCPD, continuous cyclic peritoneal dialysis; Na, sodium. The concept of dry weight is introduced as an approach to recognize subclinical volume expansion (2). Management of dry weight in patients on HD is on the basis of the gentle and gradual reduction of postdialysis weight until patients reach an “ideal” weight at which there will be no signs/symptoms of hypervolemia or hypovolemia (2). In the Dry Weight Reduction in Hypertensive Hemodialysis Patients trial (24), dry weight reduction of 0.9 kg over an 8-week period provoked a reduction of 6.6/3.3 mm Hg in interdialytic BP. Despite the obvious differences between HD and PD, the concept of dry weight is similarly applicable to those on PD. Signs/symptoms reflecting hypovolemia should be carefully monitored when managing volume in patients on PD (2). With the exception of patients presenting with clinically overt volume overload, the assessment of volume status using standard clinical diagnostic criteria is difficult. In the Brazilian Peritoneal Dialysis Multicenter study (25), the presence of pedal edema was able to detect volume expansion only in 28% out of 1089 patients on PD. Similarly, the presence of pedal edema is an insufficient tool to detect volume overload in asymptomatic patients on HD (26). Studies using more objective technologies showed that the prevalence of subclinical volume expansion among patients on PD is higher and clinical judgement is insufficient to determine whether patients are truly euvolemic. In the European Body Composition Monitoring study (27), BIA uncovered that only 40% out of 639 patients on PD were euvolemic (27). Standard clinical characteristics commonly used in dry weight assessment, such as urine output, peritoneal ultrafiltration, and BP levels, were unable to detect volume expansion (27). In a Chinese cohort of 307 patients on PD, BIA identified subclinical volume expansion in 67% of study participants (28). Among 1092 patients on PD participating in the Initiative of Patient Outcomes in Dialysis study (29), BIA showed that subclinical overhydration was detectable in 57% of participants (29). In a meta-analysis of 42 cohort studies (incorporating data from 60,790 patients on dialysis), a BIA-derived overhydration index >15% was associated with 2.28-fold higher risk for all-cause mortality (30). Among 88 patients on PD having their volume status assessed with lung ultrasound, moderate to severe lung congestion was detected in 46% of participants (31). The presence of pedal edema or dyspnea had poor accuracy in detecting lung congestion. Whether the above technologies aid the achievement of euvolemia remains unclear. This hypothesis was explored in a pilot study, in which 160 patients on PD were randomized to BIA-guided volume management versus standard care (32). Significant reductions in extracellular-to-intracellular volume ratio were noted during the 3-month follow-up in the intervention group. By contrast, the United Kingdom-Shanghai and Control of Fluid Balance Guided by Body Composition Monitoring in Patients on Peritoneal Dialysis trials showed that BIA-guided volume management did not reduce extracellular body water and had no benefit on BP control or regression of left ventricular (LV) hypertrophy (33). In a 2017 meta-analysis of seven randomized trials, BIA-guided volume management was associated with a modest reduction of 2.73 mm Hg in systolic BP that was not translated into improvement in all-cause mortality (34). The ongoing Lung Water by Ultra-Sound Guided Treatment to Prevent Death and Cardiovascular Complications in High Risk ESKD Patients with Cardiomyopathy Trial is planning to recruit 500 high-risk patients on HD, aiming to compare the effect of guiding volume management with lung ultrasound versus standard care on a composite outcome of all-cause mortality, myocardial infarction, or worsening congestive heart failure. Randomized trials are warranted to elucidate the role of these techniques in patients on PD as well. Nonadherence to a sodium-restrictive diet is a major driver of thirst and fluid intake (1). Dietary sodium intake is recommended not to exceed 2 g daily (corresponding to 5 g of sodium chloride) (2). Improvement in total body sodium balance may facilitate the achievement of adequate volume control. Although this notion is not supported by clinical trial evidence, observational studies have shown significant BP lowering in response to a therapeutic strategy incorporating dietary sodium restriction alone or combined with enhanced ultrafiltration (35). Such an approach, however, may be associated with more rapid decline in residual kidney function, whereas other observational studies have associated low-sodium intake with higher mortality, possibly mediated through deficient protein and nutrient intake (36). Longer preservation of residual kidney function arising from gentle and continuous kidney replacement therapy is a potential advantage of PD over in-center HD. A post hoc analysis of the Canada-United States study showed that each 250-ml increment in urine volume was associated with 36% lower risk for all-cause mortality (37). Administration of loop diuretics may enhance urine output and fractional urinary excretion of sodium, facilitating the maintenance of fluid balance among patients on PD with preserved residual kidney function (1). In a randomized trial enrolling 61 incident patients on PD, compared with no treatment, administration of furosemide (250 mg/d) for 12 months increased 24-hour urine output and urinary sodium excretion, but had no protective effect on preservation of residual kidney function (38). Whether intensification of diuretic therapy is beneficial or incremental among patients on PD with residual diuresis warrants investigation in future trials. Volume overload and poor BP control may arise in patients receiving a PD regimen that is inappropriately adapted to their peritoneal transport characteristics (39). Longer dwells in fast transporters limit ultrafiltration because of a rapid dissipation of glucose gradient. Observational studies showed that fast transporters had higher 24-hour BP, abnormal circadian BP patterns, and higher LV mass index than low transporters (40). Observational studies showed that fast transporting status was independently associated with higher mortality risk (41), an association possibly explained by sodium and water reabsorption when long dwells with glucose-containing solutions are prescribed to fast transporters. In this setting, transfer to APD should be considered (1). By contrast, shorter dwells in low transporters limit net diffusive sodium removal because of sodium sieving. Midday exchanges with glucose-containing solutions or icodextrin during the long daytime dwell enhance sodium removal in APD (1). Patients with substantial residual diuresis may benefit from less intensive regimens, such as dry night in CAPD and partially or fully dry day in APD (1). However, loss of residual kidney function represents a silent cause of volume overload. In this setting, intensification of PD, avoidance of dry periods, increasing dialysate glucose concentration, and appropriate use of icodextrin are therapeutic options to maintain euvolemia (1). Hypertonic glucose-containing solutions, although possibly effective in providing short-term volume control, are associated with a number of adverse effects on residual kidney function, metabolic profile, peritoneal membrane function, and technique longevity (1). Icodextrin, a starch-derived glucose polymer, is widely used as alternative osmotic agent during the long overnight dwell in CAPD or during the long daytime dwell in APD (1). The advantages of icodextrin include the intensification of peritoneal ultrafiltration, protection of peritoneal membrane from the formation of advanced glycation end-products, and neutral effect on metabolic profile (1). In a meta-analysis of 12 randomized trials (42), compared with glucose-containing solutions, icodextrin enhanced net peritoneal ultrafiltration (weighted mean difference, 448.5 ml/d; 95% confidence interval, 289.3 to 607.8 ml/d) and reduced the incidence of overhydration (relative risk, 30%; 95% confidence interval, 15% to 59%) (42) without compromising residual kidney function. Randomized trials tested also the hypothesis that the benefit of icodextrin on volume status may be accompanied by a parallel BP-lowering effect (43–47) (Table 3). A crossover study of 14 patients on APD compared icodextrin with standard 2.27% glucose solutions, both administered during the daytime dwell. Over a 4-week follow-up period, icodextrin reduced office BP by 19.5/6.0 mm Hg despite the reduction in antihypertensive medications in six out of 14 participants (47). In a double-blind trial, 50 hypertensive patients on PD were randomized to icodextrin or 2.27% glucose solutions during the long dwell for 6 months (43). Despite the absence of a significant reduction in ambulatory BP, icodextrin-treated participants required fewer antihypertensive medications to achieve BP control (43). Another trial randomized 59 diabetic patients on CAPD to icodextrin or 2.27% glucose solutions during the overnight dwell for 12 months (45). A BP-lowering effect was noted in icodextrin-treated participants, but not in those assigned to glucose-containing solutions; this effect was confirmed with ambulatory BP monitoring (48). Adequately powered randomized trials are required to elucidate the BP-lowering effect of icodextrin. Sodium removal in PD is achieved through convection with ultrafiltration as well as through diffusive transperitoneal sodium elimination (1). Dialysate sodium in currently available PD solutions is standardized to a concentration of 132–134 mmol/L, allowing only a small amount of diffusive sodium transport. Earlier interventional studies using low (120 mmol/L) or ultra-low (98 mmol/L) dialysate sodium showed that this approach enhances the diffusive removal but compromises convective elimination (49). Studies combining low-sodium dialysate with higher dialysate glucose concentrations to compensate for reduced osmolality showed that this intervention maintains peritoneal ultrafiltration, improves hydration status, and provokes significant reductions in ambulatory BP (50). The noninferiority of low-sodium (125 mmol/L) versus standard-sodium PD solutions (134 mmol/L) on dialysis adequacy (defined as a between-group difference of −0.5 in weekly total Kt/V urea) was tested in a recent trial enrolling 108 hypertensive patients on CAPD (51). This trial failed to prove the noninferiority of low-sodium solutions because total Kt/V urea was 2.53±0.89 in the low-sodium group versus 2.97±1.58 in the standard-sodium group (51). However, low-sodium dialysate enhanced diffusive sodium removal by 1.188 g/d. A significant between-group difference of −8.6/−4.6 mm Hg in office BP was noted at study completion. It has to be noted, however, that low-sodium dialysate solutions are not yet commercially available and the aforementioned results warrant investigation in phase 2 trials using ambulatory BP monitoring. Neutral pH, low-glucose degradation product solutions are introduced as alternative to standard glucose-containing solutions on the basis that their higher biocompatibility may limit peritoneal membrane injury (1). In a meta-analysis of 18 randomized trials, biocompatible solutions were associated with longer preservation of residual kidney function, particularly when their administration was extended for >12 months (42). However, biocompatible solutions were ineffective in enhancing peritoneal ultrafiltration assessed in 4-hour peritoneal equilibration tests. Similarly, 24-hour peritoneal ultrafiltration was not different between biocompatible and glucose-containing solutions (42). Biocompatible solutions are not yet available in the United States. Pathophysiology of hypertension in PD is complex and includes several nonvolume-dependent mechanistic pathways (2). When BP remains uncontrolled despite the adequate management of volume, antihypertensive therapy is the next treatment consideration to control BP. The association of agents blocking the renin-angiotensin-aldosterone system (RAAS) with survival was evaluated in a prospective cohort of 306 incident patients on PD (52). Over a total follow-up of 8422 patient months, RAAS blockade use was associated with 62% lower risk for all-cause mortality (52). As shown in Table 4, pilot randomized trials are also suggestive of a beneficial effect of RAAS blockers on intermediate end points, including short-term BP variability, LV hypertrophy, and arterial stiffness (53–56). A 2014 meta-analysis of six randomized trials showed that compared with other antihypertensive drug categories, RAAS blockers were associated with slower decline in residual kidney function (57). The efficacy and safety of mineralocorticoid receptor antagonists among patients on PD was explored in three randomized trials, summarized in Table 5 (58–60). These pilot trials suggest that add-on therapy with mineralocorticoid receptor antagonists is associated with improvement in LV mass index and LV ejection fraction, without a significant increase in the incidence of hyperkalemia. The wide use of spironolactone and eplerenone among patients on PD should be avoided in anticipation of larger trials evaluating hard clinical end points. In conclusion, epidemiology of hypertension in PD appears to follow similar patterns with the burden and prognostic significance of hypertension in in-center HD. The fact that PD is a home-based dialytic modality suggests that home BP monitoring should be widely applied as a technique with additive diagnostic and prognostic value to that of office BP recordings. Dietary sodium restriction, adjunctive use of diuretics, appropriate use of icodextrin, and adaptation of the PD regimen to the peritoneal transport characteristics are first-line volume management strategies with potential benefits on patient and technique survival. Antihypertensive therapy is recommended only when hypertension remains uncontrolled despite the adequate management of volume. Although small, randomized trials are suggestive of a beneficial effect of RAAS blockers on intermediate end points, the comparative effectiveness of different antihypertensive drug classes on hard clinical outcomes is unknown. Randomized trials rather than observational studies are needed to elucidate several areas of uncertainty in management of hypertension among patients on PD. R.A. is a data safety monitoring committee member of Astra Zeneca and Ironwood Pharmaceuticals, a steering committee of randomized trials member of Akebia, Bayer, Janssen, Glaxo Smith Cline, Relypsa, Sanofi, and Genzyme US Companies, an adjudication committee member of Bayer, Boehringer Ingelheim, and Janssen, a scientific advisory board member or consultant for Celgene, Daiichi Sankyo, Inc., Eli Lilly, Relypsa, Reata, Takeda Pharmaceuticals USA, and ZS Pharma. V.L. has received honoraria from Amgen, Baxter, and Genesis. V.V. and P.I.G. declare no competing interests. This work is supported by National Institutes of Health grant 5 R01 HL126903-02 and grant 5I01CX000829-04 from the US Department of Veterans Affairs Merit Review (to R.A.).